Mich L. in L.A.: No-Sew Mini Lampshades, Anyone? Hi, everybody! Would you like to see my new tutorial for these cute little no-sew lampshades? They're upcycled from some well worn, painty old work jeans. Um, did I mention they're no-sew? No-sew, people! To DIY, simply CLICK HERE. 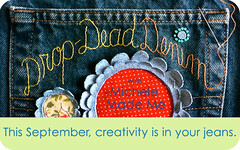 I'm guest posting on Michele Made Me, as part of her month-long series, Drop Dead Denim. I really enjoy your easy peasy post at Michele Made Me !! They're adorable and give a real sweet, country cottage look to the sconces. Very cute and simple idea...thanks for the inspiration!! I'm looking forward to more of your fabulous recycled home decor projects. Dollar Tree is going to love you even more. Adorable! Now I gotta buy some sconces. Love, love, love this project! !